Prepares for the next exposure. 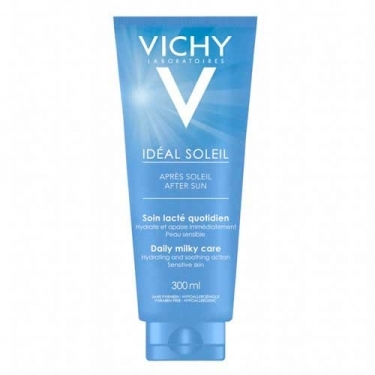 DESCRIPTION: Idéal Soleil Après-Soleil Soin Lacté Quotidien from Vichy is an after-sun care to all who seek intense hydration after sun exposure. Formulated with sodium hyaluronate and a vegetable lipid concentrate, and enriched with Vichy Thermal Water, moisturizes in depth by setting the water in the skin while nursing, soothes, strengthens and regenerates the sun-sensitized skin. Gradually, the skin is more resistant to solar aggressions. The milky and non-greasy texture, provides freshness and long lasting comfort. Tested under dermatological control on sensitive skin. Hypoallergenic and paraben free. Apply daily after bathing, whenever there is sun exposure.